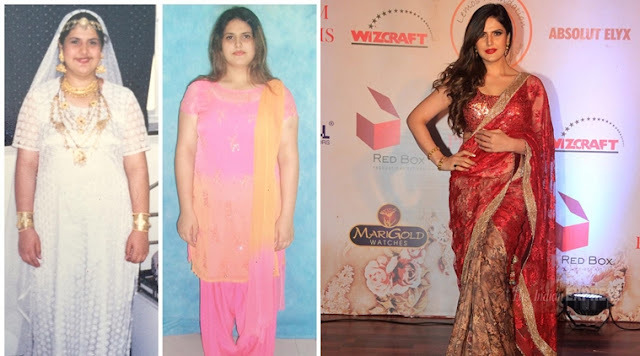 Zarine Khan on Body Shaming and her journey from fat to fit. Zarine khan opened up about her body shaming experiences and how she was targeted in her school /college days. Obesity is serious issue and not to be made fun of , Zarine's commentary however revolves around herself , That how she never bothered to heed the comments made by anyone on her physique. Zarine never stopped to think about the snide remarks and moved on with life. She started journey to reduce the weight before she entered Bollywood , for her first film( Veer opposite Salman) she did reduce much of her college weight. Zarine further reduced her weight in these 2-3 years to look fab in Hate Story 3 and her other projects. Now our remarks about Zarine. :) yes we get to criticize everyone . We think Zarine just spotted the opportunity for limelight after looking at the success of Bhumi Pednekar who did wonderful job in gaining and reducing weight for the movie. In order to capitalize some of the weight shedding mania (likes of Parineeti , Bhoomi) , Zarine went ahead and made some of her college pics of her chubby self public on Insta. We need to point out the wise readers that only reason Zarine or anyone can boast of their chubby past and transformation to slimness is because they have the nice slim physique now. If zarine was so OK with her chubby self and never bothered about pepole's comments she would never have chosen to get rid of the excess weight and fat. Fact is the obesity is serious issue and everyone needs to take care of their body as there are chronic problems associated with the former and the more early you get in shape , the more happy and fit life you would lead on.